Gadoufaoua Central Niger in is mid-Cretaceous (Aptian) in age consists of rivers and tall forests. The majority of dinosaur finds have come from the region of Gadoufaoua. the Sahara was still a great tropical plain, dotted with lakes and crossed by rivers and streams that were lined with vegetation. A number of important discoveries were made in the desert of western Egypt between 1915 and 1932, but unfortunately this material was destroyed at the end of World War II. One of the main problems with African deposits of this period is the lack of radiocarbon dating for many, making chronological interpretation difficult. Sarcosuchus twice as long as the modern saltwater crocodile and weighed approximately 8 to 10 tonnes. Sarcosuchus also had a strange depression at the end of its snout called a bulla. It seems likely that it ate the large fish and turtles of the Cretaceous. As the overhanging jaw and stout teeth are designed for grabbing and crushing, its primary prey may have been large animals and smaller dinosaurs, which it ambushed, dragged into the water, crushed, drowned and then tore apart. 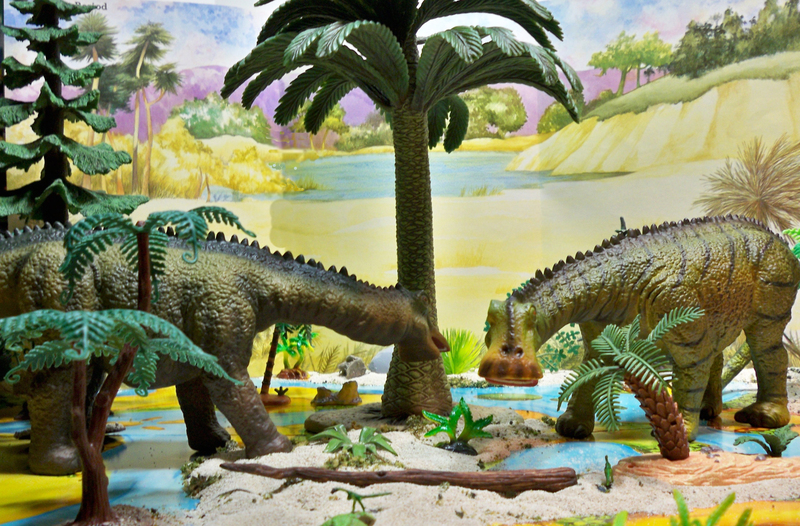 It may have come into conflict with Suchomimus, whose fossils were found in the same geological formation. The most common dinosaur is the sauropod Nigersaurus taqueti. Nigersaurus a basal member of the diplodocids was a small sauropod around 50 feet long. It developed complex set of teeth for processing food like contempoary hadrosaur and ceratopsian dinosaurs. In Gondwana sauropods evolved to fill the roles of Laurasian ornithiscians. Nigersauruswas a plant-eater that had an unusual mouth "shaped like the wide intake slot of a vacuum" that took in food and chewed it with very small, sharp, numerous small teeth, a total of about 600, in all amounting to a dental battery.